The range of this species is very widespread with many populations across much of the eastern U.S. (edge or range states less common) and also into Mexico. It is stable throughout its range and is tolerant of a wide range of habitat conditions. 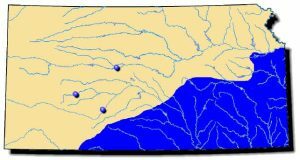 It ranges from the Rio Grande River system in Texas east to the Ochlockonee River system in Florida and as far north as the Middle St. Lawrence River system. It also extends into Nuevo Leon and Tamaulipas and Rio Sabinas (Coahuila), Mexico. Comments: As the name implies, the paper pondshell has a paper-thin shell and can be found in ponds. The shell is yellow to greenish-yellow and often cracks upon drying so is easily broken. Internally, there are no interlocking teeth and the nacre is whitish-blue and iridescent. This species inhabits still waters, thus is largely found in isolated ponds, oxbows, backwaters and permanent pools. It is well adapted to mud substrates. 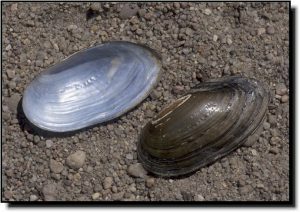 Its shells are usually found along shores where raccoons, muskrats and birds have used them for food.